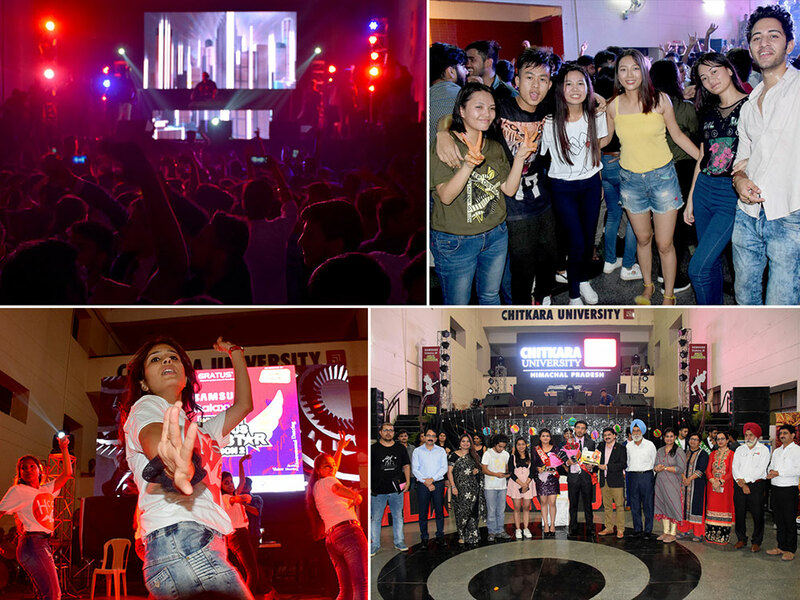 Chitkara University, Himachal Pradesh organized the Fresher’s Party 2018 to give freshmen a taste of campus fun. Rockstar evening was filled up with some power-packed performances by senior batch students. The enthusiasm for the in-house freshers’ party and Mr./Ms. Freshers 2018 was palpable, and around 100 students registered from different schools, out of which 15 boys and 15 girls were shortlisted. The event was judged by RJ Manisha and RJ Harsh. This contest saw three rounds — the ramp walk, a talent round and a question and answer session, Mr Fresher 2018 was won by Sanskar Kumar and Ms. Fresher 2018 was bagged by Ritika. There were many more titles which were given, Vaibhav bagged the title of Mr. Handsome and Ms. Charming was given to Shivani, the most confident pair in the contest was Dhruv and Sakshi who were bestowed with the titles of Mr./Ms. Confident respectively. Based on the Netflix party theme students came dressed in fancy outfits with quirky props and the award from the crowd for Mr. Dapper was given to Samik Kumar and Ms. Voguish to Anubhuti Sharmi. Freshmen dazzled the stage with mesmerizing performances in singing, dancing and acting and among them, Archi and Gagan Dogra were given the best performer award. Sanskar was adjudged as the winner of Mirchi campus Rockstar and will be referred as Agent983 and agent will have the benefit of enjoying all Mirchi Events free of cost.